I know I have been talking about relaxers a LOT lately but I just want everyone to be very knowledgable about them, especially when it comes to the health of your hair. 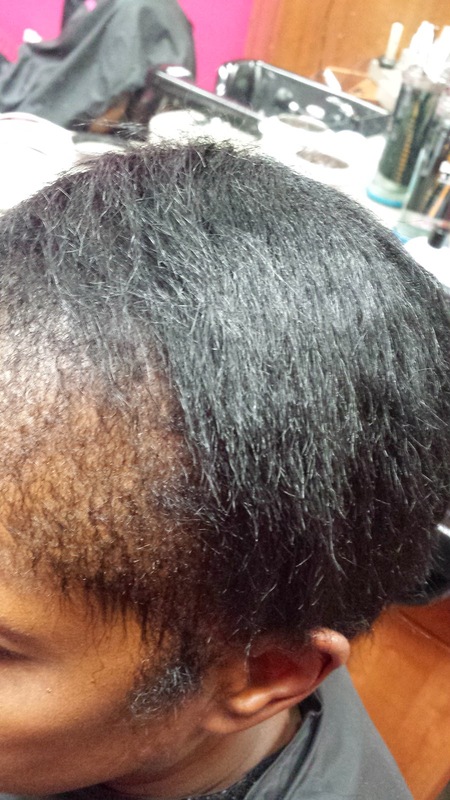 This client came to me as a result of having a lot of damage due to getting relaxers. 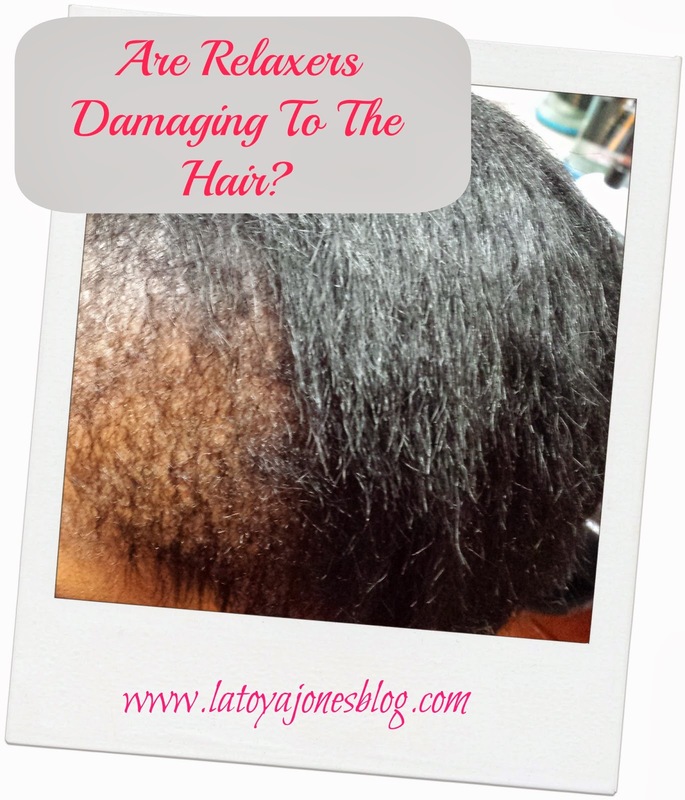 So the question comes up about are relaxers damaging or can they damage your hair? 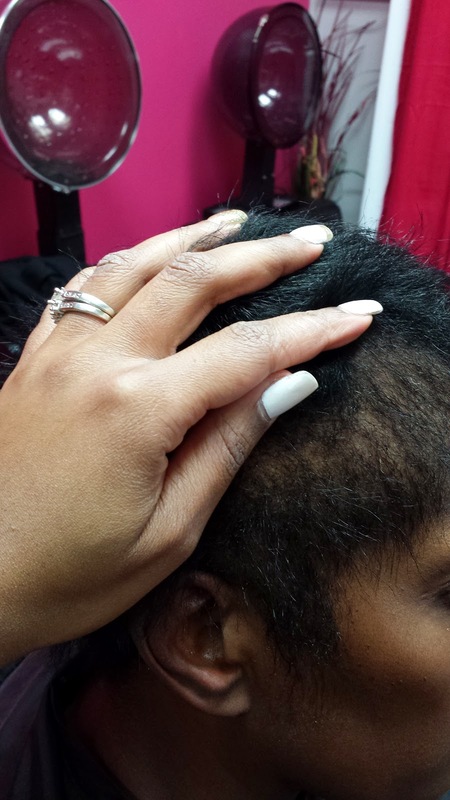 Relaxers can absolutely damage your hair IF you are not using them correctly. 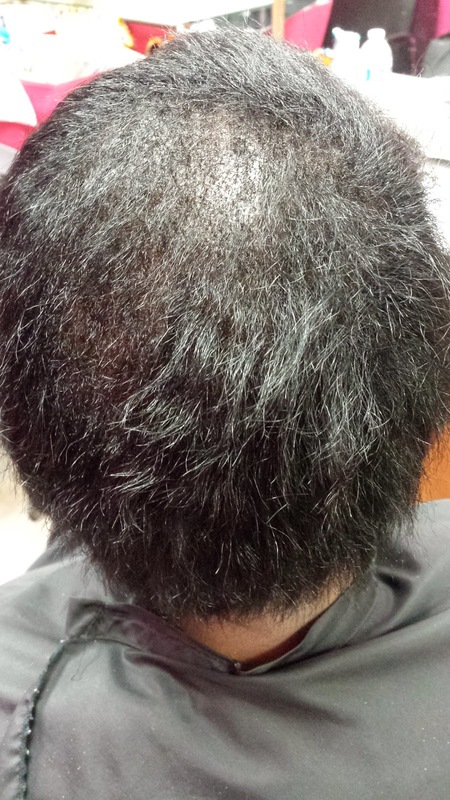 This client was going to a hairstylist that was giving her relaxers every four weeks. So, basically at every other appointment, she got a touch up! One day she woke up and took a look at her hair only to realize her edges were completely gone as well as her hair in the top of her head. She is now on a quest for healthier hair which includes giving up relaxers altogether. Unfortunately, I see this way more often than I would like. I have said before that getting a relaxer before you have two inches of new growth is too soon and can cause damage and breakage to the hair. Just because you do not see the damage immediately does not mean that it has not been done. Over time, the hair gets weaker and weaker until it gets to the point where it breaks. This client had to learn the hard way about this which is why she now wants to transition to natural hair and leave the relaxer alone period. They got them before that got two inches of new growth. Doing one or more of the things listed above always results in either damage to the hair, breakage, changes in the hair's texture, and more. Any time you receive relaxer damage and it does not result in visible damage right away, it tricks you into thinking that nothing is wrong. Over time as you begin to notice changes in your hair you may begin to wonder what is causing it. Believe me when I say, if overlapping has occurred on your hair, the damage has begun. Continuing to get previously relaxed hair relaxed only makes it worse and worse. The goal of a relaxer is to only relax hair that has never had relaxer on it. Getting relaxers the correct way and by a hairstylist who is knowledgable about what they are doing will ensure that you will have healthy hair with your relaxers. I know have to treat this client's hair and nurse it back to health. It will grow back but it is going to be a slow process. It took time for the damage to happen and it will take even more time to get 100% healthy but that is why I got into this business! I love taking hair like this and getting it back to its healthy state. As long as this client continues to come to me I will help get her hair back the way it used to be. She wants to grow it out and get it long and healthy. Stay tuned for periodic updates on this client. Remember to keep your hair healthy! At some point yes relaxers can do some damage. Like you said even if you don't see the damage it's there. That's why we have to be mindful of what we put in our hair. As the old phrase go "if you have to wear gloves applying it, then think about what's going on with your scalp." I remember when relaxer got on my forehead, I didn't know it was there and then I felt a burning sensation and once I rubbed my forehead,my skin was gone with it. LADIES: if you live relaxers,just be careful how you use them. I'm in the same situation as the above client. Please help me.